Alpine i207-WRA Mechless Audio/Video Receiver with both Apple CarPlay™ and Android Auto™ capabilities optimizes your main smartphone features in a way that lets you concentrate on your upcoming adventure. Enjoy the latest in-vehicle smartphone technology along with a dash bezel that is fitted for your Wrangler. The 7-inch i207-WRA is Alpine engineered for the Jeep Wrangler. The i207-WRA comes with an Alpine-designed dash kit that mounts to the 7-inch screen and provides a matching fit and finish to your Wrangler, as if it came that way from the factory. The i207-WRA is mechless (no CD/DVD slot) but still has more than enough entertainment options to keep your drive enjoyable. The i207-WRA comes with everything you need to install this into your 2007-2017 Jeep JK, including some parts you didn’t even know you needed! Along with the JK-matched kit design, the package includes a metal rear bracket that holds the unit stable as you hit the trails. A fully loaded wiring harness allows for direct plug and play installation to the Jeep as well as harnesses for future upgrades like the KAC-001 Accessory controller or the KCX-C250MC multi camera controller. Finally, a programmable iDatalink Maestro module is included (a $129 value) for steering wheel and vehicle information integration. Be smart when using your smartphone on the road. The i207-WRA is compatible with both Apple CarPlay and Android Auto. After connecting your smartphone via the charging cable, and activating Bluetooth for Android Auto use, you get your music, driving directions, and phone calls – all controlled from the 7-inch touchscreen and heard through your Wrangler’s speaker system — so you don’t have to look at or touch your phone and can keep it safely stored away. The i207-WRA does not have a built-in GPS navigation system. Instead, navigation guidance is provided by the maps feature in Apple CarPlay or Android Auto so you get voice and onscreen driving directions directly on the 7-inch touchscreen. The i207-WRA “Works with Apple CarPlay” and lets iPhone users make and receive calls, access text messages, play music, and get directions in a way that allows them to stay focused on the road. 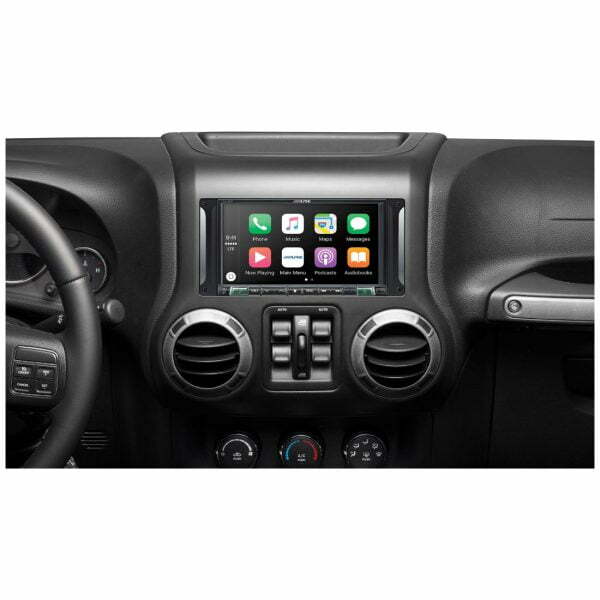 Apple CarPlay is accessed through the capacitive touch screen or the “Voice” hard button to activate Siri voice control and is compatible with iPhone 5 and later. The i207-WRA is Android Auto Compatible. Android Auto was designed with safety in mind. With a simple and intuitive interface, integrated steering wheel controls, and powerful new voice actions, it’s designed to minimize distraction so drivers can stay focused on the road (requires both a USB cable and Bluetooth connection; requires the Android Auto app on Google Play and on Android compatible smartphone running Android™ 5.0 Lollipop or higher). Android Auto is accessed through the capacitive touch screen or the “Voice” hard button with voice control. The i207-WRA comes with one camera input that can be assigned as a front or rear camera. Add the HCE-TCAM1-WRA Rear View Camera and Light System for style and another set of eyes for the rear. Choose a front and side camera with various views like ground view, wide-angle views to see past your Wrangler and multi-angle views to see two images on the screen. Adding a front camera to your JK is also helpful to maneuver around obstacles on trails. Be smart when using your phone on the road. The built-in Bluetooth® wireless technology allows for hands-free calling, secure simple pairing (SSP) and call waiting.